Swing Framework contains a set of classes that provides more powerful and flexible GUI components than those of AWT. Swing provides the look and feel of modern Java GUI. Swing library is an official Java GUI tool kit released by Sun Microsystems. It is used to create graphical user interface with Java. Swing classes are defined in javax.swing package and its sub-packages. JFC is an abbreviation for Java Foundation classes, which encompass a group of features for building Graphical User Interfaces(GUI) and adding rich graphical functionalities and interactivity to Java applications. Java Swing is a part of Java Foundation Classes (JFC). JPanel : JPanel is Swing's version of AWT class Panel and uses the same default layout, FlowLayout. JPanel is descended directly from JComponent. JFrame : JFrame is Swing's version of Frame and is descended directly from Frame class. The component which is added to the Frame, is refered as its Content. 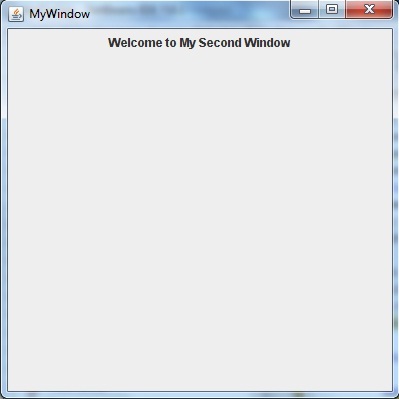 JWindow : This is Swing's version of Window and has descended directly from Window class. 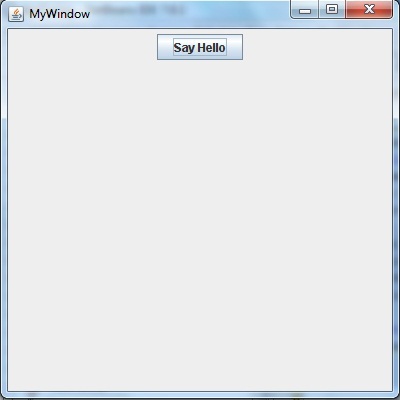 Like Window it uses BorderLayout by default. JLabel : JLabel has descended from JComponent, and is used to create text labels. JButton : JButton class provides the functioning of push button. JButton allows an icon, string or both associated with a button. JTextField : JTextFields allow editing of a single line of text. There are two ways to create a JFrame Window. add(lb);			//adding label to frame. setLayout(new FlowLayout());	//setting layout using FlowLayout object. Import the javax.swing and java.awt package to use the classes and methods of Swing.